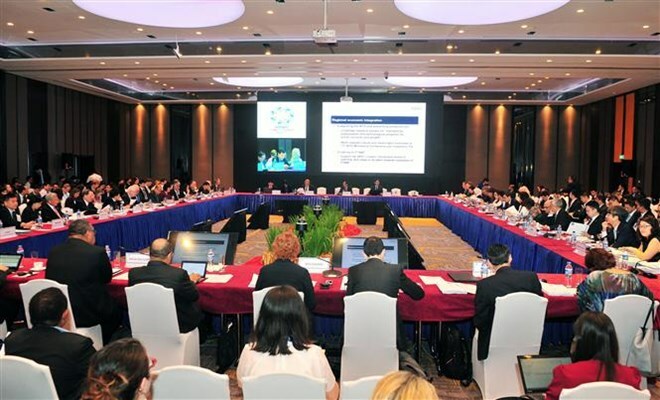 HCM City (VNA) – The third Senior Officials’ Meeting (SOM3) of the Asia-Pacific Economic Cooperation (APEC) began in Ho Chi Minh City on August 29, expected to lay the crucial groundwork for the APEC Leaders’ Week slated in November in Da Nang city. In his opening remarks, Deputy Minister of Foreign Affairs Bui Thanh Son, APEC 2017 SOM Chair, highlighted the strong outlook for the Asia-Pacific, as he heard at the recent third meeting of the APEC Business Advisory Council (ABAC3). “But this bright prospect of growth, and also that of trade, hinges on the policy choices and actions by economies,” he said. As suggested at ABAC3, the main reasons for global trade declaration include, among others, weak investment, slower trade liberalisation and reduced formation of cross-border production chains, Son said. He, therefore, underscored the need to look carefully into the APEC work to see what can be done. APEC has done quite well so far, particularly with major actions committed by trade ministers, the APEC SOM 2017 Chair said, noting that progress has been made in all committees, working group and sub-fora, as well as in a number of new initiatives. To date, over 200 meetings have been held across the numerous workstream of APEC. Over the past ten days alone, a series of almost 80 meetings have been organised, including many significant, high-level events, he said. “The Food Security Week in Can Tho which concluded with the High-Level Policy Dialogue on Food Security and Sustainable Agriculture in response to Climate Change produced important results, including the Can Tho Statement and two Action Plans on Food Security and on Rural-Urban Development,” he said. “The High-Level Meeting on Health and the Economy, with the participation of many Health Ministers, sought ways to boost patient-first investment and build capacity for healthcare financing and access in the region, for the ultimate aim of ensuring a healthy and productive workforce,” Son added. This SOM 3 is expected to cover a lot of work, including to review the work of the Economic Committee (EC), the Committee on Trade and Investment (CTI), the APEC Steering Committee on Economic and Technical Cooperation (SCE), and the Budget and Management Committee (BMC), and build on the inter-sessional work to finalise the proposed outcome documents for potential submission to the ministers and leaders, he said. According to Son, host Vietnam, will also update APEC member economies on the preparations for the APEC Leaders’ Week in the central city of Da Nang, as well as major events in the lead up, including the Women and the Economy Forum and the SME Ministerial Meeting. The SOM 2017 Chair expressed his belief that with their combined wisdom and hard work, good will and determination, the APEC economies will secure good outcomes of this meeting and lay the crucial groundwork for a successful Leaders’ week. The two-day meeting will look into APEC committees’ work in support of the APEC 2017 priorities and SOM-level issues.